NETWORK FINALS: EMPIRE and THE GOLDBERGS went up 0.1 in final numbers. CABLE HIGHLIGHTS: FX’s AMERICAN HORROR STORY topped Wednesday cable, up 0.03 from last week to 1.46. On Comedy Central, SOUTH PARK returned from a week off at 1.11, up 0.02 from 2 weeks ago, and LEGENDS OF CHAMBERLAIN HIGH was down a tick to 0.34. On Lifetime, the LITTLE WOMEN franchise had ATLANTA up 0.05 to 0.61, and LA up 0.06 to 0.59. OWN’s QUEEN SUGAR climbed 0.11 to 0.51. On Food Network, WORST COOKS IN AMERICA was up 0.04 to 0.47. Presumably it was the continuing election news that put MSNBC’s RACHEL MADDOW SHOW (0.43), Comedy Central’s THE DAILY SHOW (0.42) and CNN’s ANDERSON COOPER 360 (0.40) in unaccustomed places in the Top 10, along with other current events telecasts throughout Top 50. 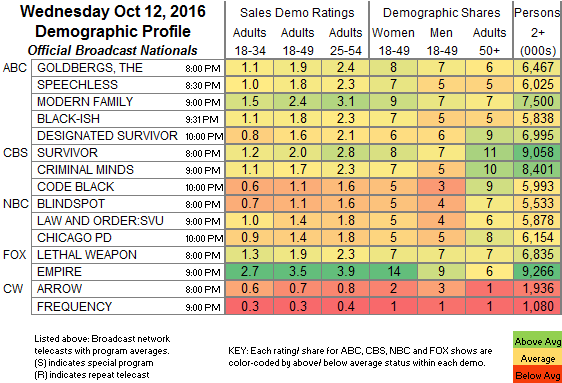 On E!, TOTAL BELLAS added 0.09 to 0.39, and CATCHING KELCE was up 0.03 to 0.16. Spike’s LIP SYNC BATTLE returned at 0.38, with an AFTER-SHOW at 0.30. NBC Sports Net had an NHL game at 0.36. On HGTV, HUNTING VINTAGE was at 0.33, PROPERTY BROTHERS was down 0.02 to 0.32, and HOUSE HUNTERS INTL was down 0.03 to 0.31. Bravo’s DON’T BE TARDY was steady at 0.31. The season finale of Discovery’s DUAL SURVIVAL was up 0.02 to 0.27. REAL WORLD returned to MTV at 0.25/0.22. A&E’s CRISS ANGEL: TRICK’D UP special was at 0.21. On Syfy, PARANORMAL WITNESS ticked down to 0.20, and GHOST HUNTERS fell 0.06 to 0.18. TLC’s TODDLERS & TIARAS fell 0.07 to 0.17, with the PRE-SHOW down 0.05 to 0.12, and LITTLE MISS ATLANTA gained 0.02 to 0.13. 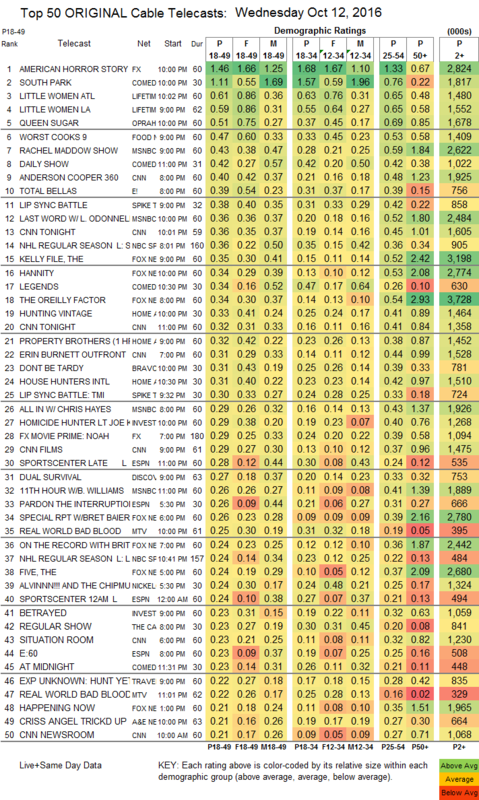 TV Land’s YOUNGER dropped 0.05 to 0.14, and IMPASTOR was down 0.04 to 0.07. Spike’s THAT AWKWARD GAME SHOW arrived at 0.14. FXX’s YOU’RE THE WORST ticked up to 0.10. IFC’s DOCUMENTARY NOW fell 0.03 to 0.03/120K.